Baca, Baron, Leser and Kain (2004) introduce a process oriented approach to analyse and improve the behaviour of table tennis players. Through reducing the game characterising parameters of the data collection system to the very essential ones for the coaching process this method was adapted for the implementation in practice. Baca, Baron, Leser and Kain (2004) introduce a process oriented approach to analyse and improve the behaviour of table tennis players. Through reducing the game characterising parameters of the data collection system to the very essential ones for the coaching process this method was adapted for the implementation in practice. The paper gives an overview of the modified system and exemplifies one possible scenario for using this system to support coaches and athletes in preparing for a competitive opponent (e.g., whilst a tournament). The basic ideas of the method have also been used to realise a table tennis specific game analysis software. Some screenshots and explanations describing this tool illustrate how the analysis concept is used in practice. In today’s world of sports, computer-aided video and game analysis programs have become standard tools for preparing and analysing competitions, and for training use. Lames and Hansen (2001) discuss the methodical way of day-to-day use of such systems for game sports in general, while Dufour (2000) and Leser (2006) give concrete examples of how these systems can be used in soccer and fistball. Depending on the approach chosen, the analysis processes focus on different criteria. All these concepts share, however, some fundamental elements. Figure 1. Workflow of applied match analysis in table tennis. Figure 1 illustrates the procedure for analysing table tennis matches by the method presented in this paper. Matches are recorded on video and, if possible, observed on location. In shooting the video a standard perspective from the long side of the table including an adequate view of the players’ action areas is recommended (see coverage angle in Figure 2 from the video window). The completed game video is used for quantitative data collection (section 3) whose results, together with the impressions of the match observer, are proper used in the analysis (section 4). Finally the results are translated into a training plan during a video-aided meeting with the player. Figure 2 shows the data collection screen comprising three areas: form for point information, form for stroke information and video window. Special attention was given to the usability of the system – e.g., using graphical input assistances for some parameters instead of having to write long attribute lists. Figure 2. Data collection screen. Only few of the game and performance parameters, which are necessary to describe a table tennis match, have to be gathered manually by mouse action or alternatively per keyboard-shortcut: • type of stroke (forehand/backhand, topspin, conter, block, defense, etc.) • impact position of the ball on the table • instant of service and moment when the point is finished • type of error (out, net, etc.) 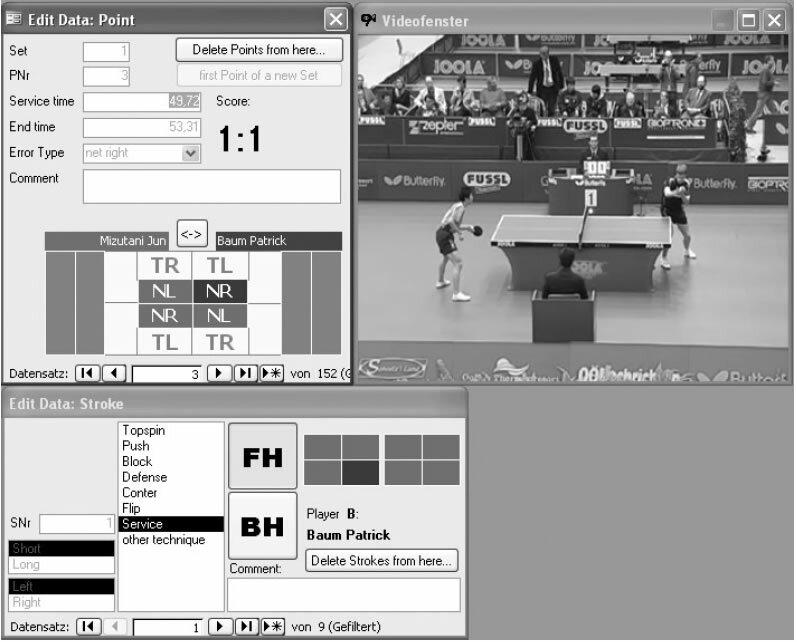 All other parameters that are required for the analysis are added automatically after entering some initial information at the beginning of the match respectively from the parameters entered manually (e.g., by marking the type of error on the correct side of the interactive table the system “knows” which team made the point): • number of set • number of point • current score • number of stroke • server • receiver • length and direction of the stroke (short/long, left/right) • winner of the point Video capturing and entering the information into the point form may be done during the game. Consequently, video feedback (selective access to all rallies/points) and elementary statistics (regarding to point information) are available immediately after the game. Further analyses (regarding to stroke information) require entering the parameters characterising each stroke. Since this process is very time consuming it can only be done offline (after the match, using the digital game-video). Depending on the duration of the game this procedure lasts between one and two working hours. In the next step, a standard evaluation of the collected data is presented in a clear manner (figures, tables, diagrams, etc.) that is easily comprehensible for the user. Evaluations relate primarily to some structural features of the match (e.g., distribution of stroke types used) and success and failure-related statistics (e.g., type and number of faults, type and number of scoring strokes, etc.). A comparison of results against reference values allows to filter differing results automatically and to be studied in greater detail. 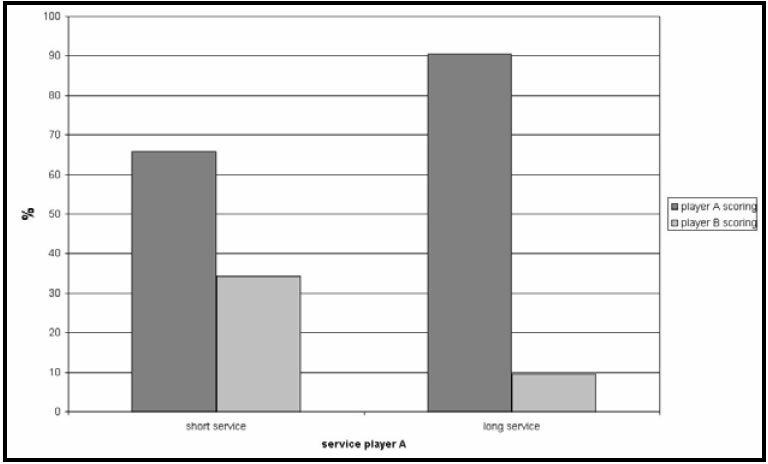 The diagram in Figure 3, for instance, contains the success rate of an athlete (player A) showing that he scored a point in 90 % of all rallies he had started with a long service. Figure 3. Success and failure of player A when starting a rally with his own service. Figure 4. Video feedback screen. The software tool used for video analysis provides selective access to all scenes of interest and has the benefit of saving about two thirds of total video time by replaying only the net playing time as the start and end points of each rally can be accessed directly. This economic aspect is most beneficial when the system is used in situations where little time is available for analysis (e.g., between two rounds of a tournament). The first step in practical training is a video-aided meeting of the coach with the athlete. 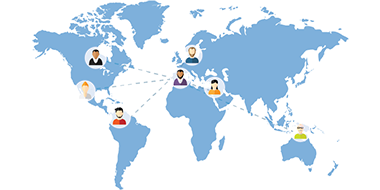 Again, the video feedback tool with the above-mentioned benefits can be extremely helpful. However, in order to save time and because intensive study of video content quickly causes fatigue of the central nervous system, the trainer should not use all the video sequences used for the preliminary analysis but rather selected sequences with comments by the trainer (refer to fig. 4 for the comment function provided by the software). For didactic reasons, the trainer and player should jointly work out the analysis that is part of the second step and the consequent strategy (e.g., for the match against the next opponent). Concrete instructions that might result from the analysis of the examples given earlier might be, “Respond to long services of your opponent as passively as you can because he usually scores on active returns! Then try to place topspin strokes right in the center!” If there is enough time between completing the entire match analysis and the next competition, the competition strategy and concrete tactical instructions for the various game situations may be appropriately drilled with practice and playing exercises during the training sessions. 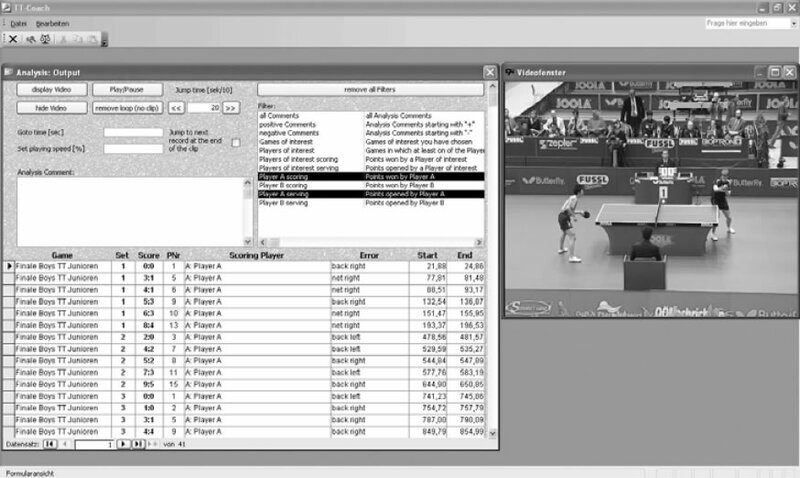 The described workflow for match analysis can be seen as practice-proven way to support table tennis players with helpful information about game competitions. At the end of this process the results of the analysis are implemented into the training, e.g., positioning fast topspin strokes rather to the middle of the table than to the side. 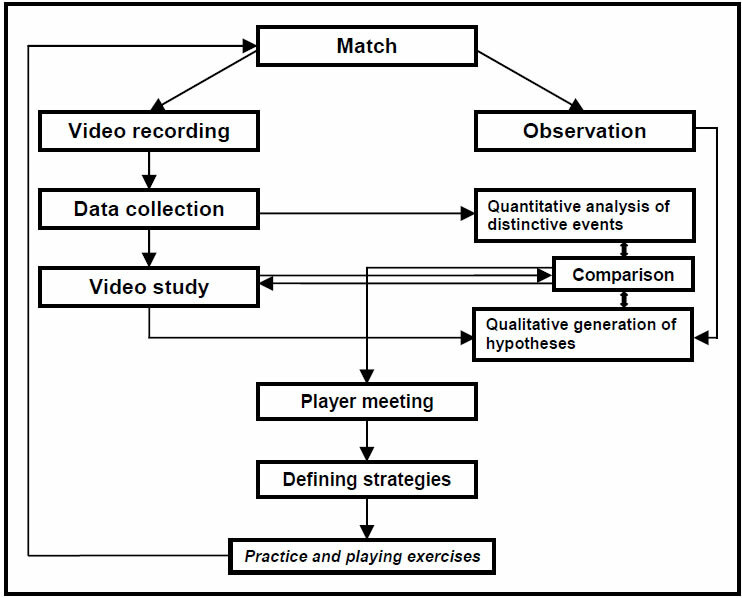 It is expected that the introduced method combining expert knowledge with quick and feasible quantitative analyses by using an integrated and efficient game and video analysis tool is very helpful to develop promising competition strategies – future use will show if this workflow turns out to be useful. 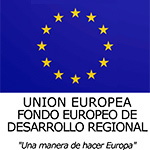 Baca, A., Baron, R., Leser, R. and Kain, H. (2004). “A process oriented approach for match analysis in table tennis“. A. Lees, J. F. Kahn and I. W. Maynard (Eds. ), Science and Racket Sports III, 214-219. London: Routledge. Dufour, W. (2000). “Computer assisted scouting in soccer”. T. Reilly (Ed. ), Science and Football 3, 160-166. London: Spon. Lames, M. and Hansen, G. (2001). “Designing observational systems to support top-level teams in game sports”. International Journal of Performance Analysis, 85-91. Leser, R. (2006). “Zum Einsatz eines computergestützten Spielbeobachtungssystems im Leistungs-Faustball“. K. Witte, J. Edelmann-Nusser, A. Sabo and E.F. Moritz (Eds. ), Sporttechnologie zwischen Theorie und Praxis IV, 209-214. Aachen: Shaker.